I can’t shake the image of chooks competing for scraps when it comes to reflecting on the modicum of 2019 Federal Budget announcements that would actually encourage healthier Australians. The health initiatives announced in Tuesday night’s budget have been gratefully acknowledged by relevant health groups in primary care, medical services and medical research. However, with the laudable exception of $736 million for mental health and suicide prevention and $20 million for smoking control, the budget has once again made mere gestures towards preventative health measures that address Australia’s other big killers. As suggested by the Public Health Association of Australia (PHAA), the list of worthwhile public health initiatives is short in number and shorter in value. For alcohol, the picture is particularly grim for those looking to prevent alcohol harm. There is a paltry four mentions of alcohol in the 2019 Budget Paper 2 – where all the funding is allotted. The $9.6 million for more treatment, support services and resourcing for alcohol and other drugs in remote, rural and regional areas is to be welcomed. The rural community suffers a disproportionate burden of alcohol harm and loses too many of its residents to alcohol each year. But frankly, this is chicken-feed when compared to the need. On a population-wide scale, alcohol use and related harm kills almost 6,000 adults and children and costs taxpayers $36 billion every year. Yet this budget contains zero specific-funding for alcohol harm prevention. Alcohol is a hidden harm that is too often overlooked, when in reality this is a grave issue that warrants priority policies and population-wide measures to reduce the availability, affordability and marketing of alcohol. Mental health problems rarely occur in isolation, and it is well documented that alcohol and other drugs increase the severity of mental illness and diminish successful treatment outcomes. Alcohol is also linked to a large proportion of suicides. National Rural Health Alliance CEO Mark Diamond fears the mental health funds will not find their way to rural Australia where communities are dealing with drought and other extreme conditions, and says there is no budget support to address a critical shortage of allied health professionals including psychologists. FARE’s disappointment in the lack of alcohol harm prevention spending has an ironic twist when it comes to sport. An ambitious proportion of the budget is being siphoned into the sports sector, including $33 million over the forward estimates for the new National Sports Integrity Commission. It is true that the governance of Australian sport sorely needs greater integrity when it comes to the constant stream of illegal and unethical behaviour of players and interested parties. Surely this funding would be better spent in financially aiding our sporting codes to end their addiction to alcohol, junk food and gambling sponsorship and then phasing out alcohol advertising, as was the right outcome with tobacco advertising to achieve a genuine health benefit. Recent FARE research demonstrated that reducing alcohol advertising would lead to a drop in the risky drinking of young Australians. Instead our children continue to be targeted by alcohol ads during free-to-air TV sports, which pressures them to drink earlier, more frequently and at dangerous levels. 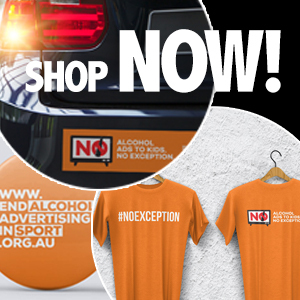 Remove alcohol advertising, along with other unhealthy commodities, and perhaps sport could begin to clean up its own act, especially given that sport has such an important role in defining Australia and Australians. When analysing this Government’s budget, it is not surprising that critics continue to emerge from so many pockets of the health sector. As the PHAA’s Terry Slevin politely said, “The long-term wellbeing of the community has not figured sufficiently in the budget”. With an election looming, AMA President Dr Tony Bartone observed that the government has set up a genuine health policy competition for the upcoming election, noting there were obvious gaps in prevention. “We expect to hear more on these key areas from all parties before the election,” Dr Bartone said. The upcoming NSW election gives politicians an opportunity to demonstrate strong leadership and tilt the balance back in favour of the people, and not the alcohol industry.